A recent post on Vox went viral with the argument that cyclists shouldn’t have to make full stops at stop signs and should be allowed to proceed through red lights “Idaho stop”-style. For those of you that believe automobile traffic laws should apply to cyclists, my first reaction is (and please don’t be offended because, granted, this is a broad brush): do you ever bike? Do you bike in traffic? In the United States? Perhaps you do. I admit that I didn’t until the last few years, but doing so opened up my eyes to a new set of challenges and changed a lot of my beliefs on cycling in urban areas. We need to rethink our urban areas. 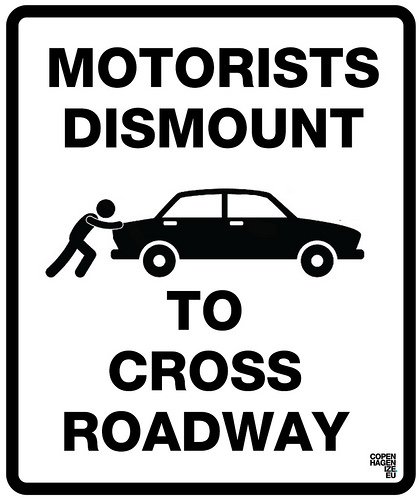 They need to be redesigned around a new set of values, one that doesn’t seek to accommodate bikers and pedestrians within an auto-dominated environment but instead does the opposite: accommodates automobiles in an environment dominated by people. It is people that create value. It is people that build wealth. It is in prioritizing their needs — whether on foot, on a bike or in a wheelchair — that we will begin to change the financial health of our cities and truly make them strong towns. Elsewhere on the Network today: The Political Environment reports that a lawsuit against Wisconsin DOT has yielded a settlement that will provide $13.5 million for transit service during construction of a massive Milwaukee highway project. Streets.mn discusses colleges’ natural orientation toward urbanism. And Steve Patterson at Urban Review STL explains why he’s voting “no” on Missouri’s proposed transportation sales tax hike.